Joe Lauzon got the split decision over Marcin Held in the co-main event of UFC Fight Night at Talking Stick Resort Arena in Phoenix on Sunday, yet the first person to dispute the verdict was the classy lightweight vet. Scores were 29-28 twice and 27-30 for Lauzon, now 27-13; Held falls to 22-6. A takedown attempt by Held early in the fight was greeted by a series of elbows from Lauzon, who appeared to hurt the Poland native with the barrage as the two fell to the mat. There, Lauzon looked for an armbar, but Held escaped and got to his feet. Midway through the round, Held did get his takedown, and he quickly moved into side control. Lauzon patiently got back to his feet with a little over a minute remaining, and neither fighter was able to make another significant statement before the horn ended the frame. Held kicked off the second round with a takedown, and he was able to take Lauzon’s back. Lauzon coolly fought his way free, then went on to score a brief takedown of his own before the two locked up against the fence. As the round approached the three-minute mark, Held delivered with another takedown, but it was Lauzon who nearly locked in the armbar before Held pulled free. The fighters kept it standing in the first two minutes of the final round, with Held breaking up the sequence with a quick takedown. Once the two rose, both fighters got in some shots and then clinched, trading position against the fence before another Held takedown in the final minute. 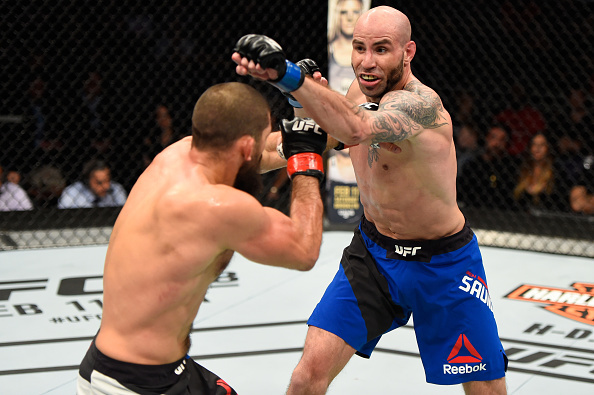 Welterweight veteran Ben Saunders held off a spirited effort from former Ultimate Fighter winner Court McGee, taking a close unanimous decision in a grueling three-rounder. Scores were 29-28 across the board for Saunders, now 21-7-2; McGee falls to 19-6. Both welterweights fought at a fast pace in the opening round, McGee initially getting inside effectively. But after that early success, Saunders was able to keep McGee on the outside, where he fired off kicks and punches, one of which opened a cut over McGee’s left eye. McGee’s steady pressure didn’t let up in the second, and it started to pay dividends this time around, as he got in several hard shots while also mauling Saunders against the fence at times. In the third, McGee jarred Saunders on a couple occasions, making sure to stay in Saunders’ face as often as he could. Midway through the round, McGee landed the first takedown of the fight, and his ground-and-pound attack piled on more points, but Saunders’ early work was enough for him to get the nod on the scorecards. In the main card opener, rising flyweight star Sergio Pettis scored the biggest win of his career, taking a unanimous decision over former world title challenger John Moraga. Scores were 30-27 and 29-28 twice for the No. 15-ranked Pettis, now 15-2. The No. 8-ranked Moraga falls to 16-6. A patient Pettis looked sharper than ever in the first round, with his right hand doing particular damage, as it bloodied Moraga, staggered him, and even dropped him at the horn ending the opening stanza. Moraga got a takedown in the second minute of round two, trying to switch things up on the Milwaukee native. 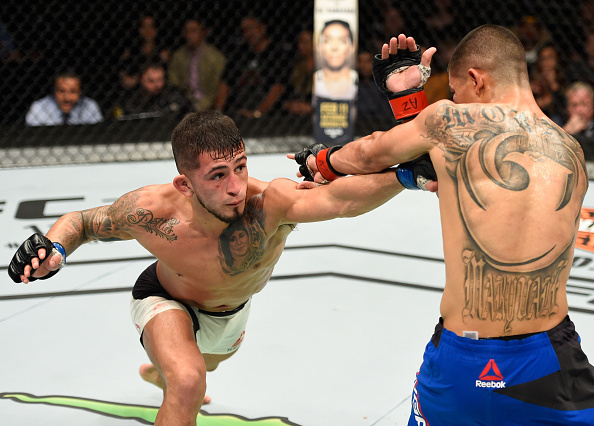 The two didn’t stay grounded long, and Pettis was able to resist any further takedown attempts. The round was closer than the first, but Pettis likely edged it. With three minutes left in the third frame, Moraga got an important takedown, but Pettis was able to reverse position and then get back to his feet with two minutes to go. From there, Pettis continued using a disciplined striking attack before finishing the round with a takedown of his own that sealed his third consecutive victory.